Sedulius was a 5th-century Christian poet. His main work, included in this manuscript, is called the Easter Poem, which is divided into five parts, the first of which contains a summary of the Old Testament, and the other four contains a summary of the New Testament. This manuscript is part of what was once a much larger volume (a former owner separate the parts by different authors) which contains an ownership inscription of the Cistercian Abbey of Thame, between Aylesbury and Wallingford, in Oxfordshire. 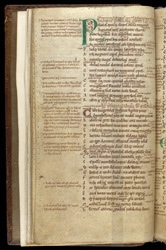 This page has the start of the Easter Poem, introduced by a simply ornamented green initial P. There is an extensive series of glosses between the lines and in the outer margin.